A soup for all seasons: fresh cauliflower with Cheddar and lots of dill. 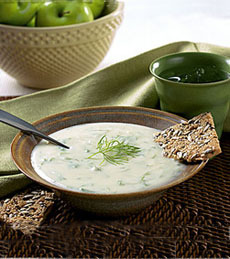 Green and white for St. Patrick’s Day, springtime or anytime, this tasty recipe is made with reduced-fat Cheddar and serves 8. In large saucepan over medium-high heat, combine onion and oil; cook, stirring, until onion is tender, 3 to 5 minutes. Add cauliflower and cook, stirring, for 2 minutes longer. Add broth and milk to pan and bring to boil. Reduce heat to maintain gentle simmer, cover pan and cook for 30 minutes until cauliflower is very tender. In blender, purée soup in batches. Return to pan over medium-low heat. Whisk in cheese and continue stirring just until melted. Whisk in dill and serve.